Countries in northern Africa and the Maghreb are covered in the Mediterranean region. Oscar, E.M. & Salam, A. 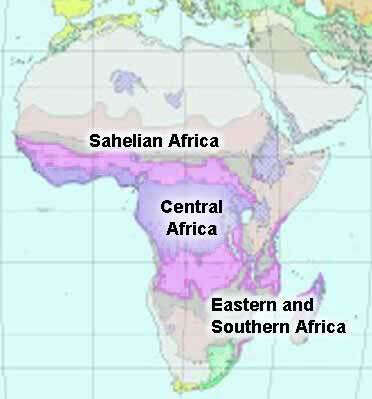 1999.State of forest genetic resources in the Sahelian and North-Sudanian zone of Africa. Forest Genetic Resources No.27. FAO, Rome. Sigaud, P., Hald, S., Dawson, I. & Ouédraogo, A.S. 1998. FAO/IPGRI/ICRAF Workshop on the Conservation, Management, Sustainable Utilization and Enhancement of Forest Genetic Resources in Dry-zone Sub-Saharan Africa. Forest Genetic Resources No.26. pp.9-12. FAO, Rome. Sigaud, P. & Luhanga, J. 2000.SADC Sub-Regional Workshop on Forest and Tree Genetic Resources. Forest Genetic Resources No.28. FAO, Rome. Zeh-Nlo, M. 2002. Approche méthodologique en vue d'une évaluation des ressources génétiques forestières dans les pays de l'Afrique Centrale. Note thématique sur les ressources génétiques forestières. Document de travail FGR/75F. Service de la mise en valeur des ressources forestières, Division des ressources forestières. FAO, Rome. Sahelian Africa: FAO. 1999. Progress towards the development of Regional Action Plans on Forest Genetic Resources. Draft technical guidelines on the identification and definition of national priorities. Secretariat Note, 11th Session of the FAO Panel of Experts on Forest Gene Resources. Document FORGEN/99/5. Forest Resources Division. FAO, Rome.